King Locksmith of Friendswood has a wide and varied choice of services that can increase your business security and provide you with convenience that you need to operate. From installing new locks to changing keys to and helping you unlock doors when you are locked out we have what you need. Are you in need of Lock Rekey since you have moved into a new building that was previously occupied? 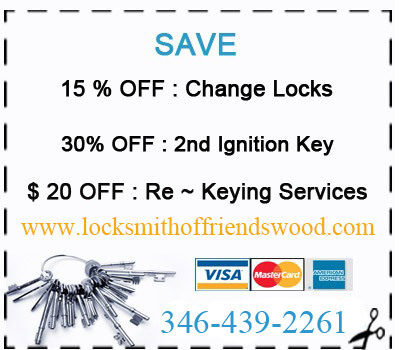 In case you need this service, our experienced locksmiths can provide you with a brand new set of keys that are different from ones used by prior clients. This service is critical for any business because it provides you with the assurance that old keys cannot be used to enter your building. In case you need to have a Master Key System that enables you to open all the doors of your building using one key, we can make one for you. This system not only makes it convenient to access any of your doors, it saves you time since you don’t have to keep looking for the right key every time you need to lock or unlock your door. This kind of system can also provide you with devices that only need passcodes to operate instead of manual keys.